On a hot summer day in Danville, what is better than sitting on the porch and sipping a cold iced tea? But be careful – if you are like many people and enjoy chewing on a few ice cubes from time to time, your relaxing afternoon could quickly turn into a painful dental emergency! Mouth injuries can happen when we least expect them, so it is important to know what to do in case they should occur. Here are a few tips from an emergency dentist in Danville on how to handle common dental emergencies. Knocked out tooth – Try placing your tooth back in the original socket, being careful not to touch the root. If you can’t, then place the tooth in a small, secure container of milk and head to the dentist’s office immediately. Cracked or broken tooth – Clean your mouth with warm water and apply a cold compress to your face to reduce swelling. Save and rinse the broken pieces; the dentist may be able to reattach them. 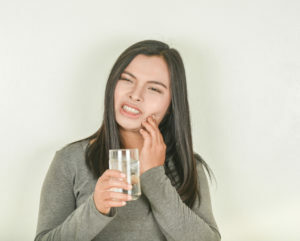 Toothaches – Clean your mouth by rinsing with warm water. Objects stuck in your mouth – Try to gently remove the object with floss. Do not try to use a sharp or pointed instrument, as you risk further injuring your mouth. Bite or cuts to your mouth or tongue – Cuts inside your mouth cause a lot of bleeding, but these types of injuries often look worse than they really are. Clean the area with warm water and apply a cold compress to relieve swelling. Following these simple steps can help relieve pain during the time it takes to arrive at the dentist’s office. Guard your teeth when playing sports by wearing a protective mouthguard. Be careful what you eat. Hard foods like popcorn kernels, hard candy or ice cubes can easily crack a tooth, so you are better off avoiding them. Use scissors – not your teeth! – to open packages. However, if the unexpected still happens and you seriously injure your mouth, follow the steps above and be sure to call an emergency dentist in Danville. The team of dental experts at Danville Dental Associates pride themselves on providing comfortable and cost-effective dental care for their patients. With five convenient community locations, Danville Dental Associates is there for you in case of a dental emergency. For more information, visit their website today or call the office at +1 434-799-8825.